Exit polls had earlier predicted a tight race with no clear winner, and after initial results Mr Gantz also claimed victory. But as the votes were counted overnight, Benjamin Netanyahu's success became clearer. 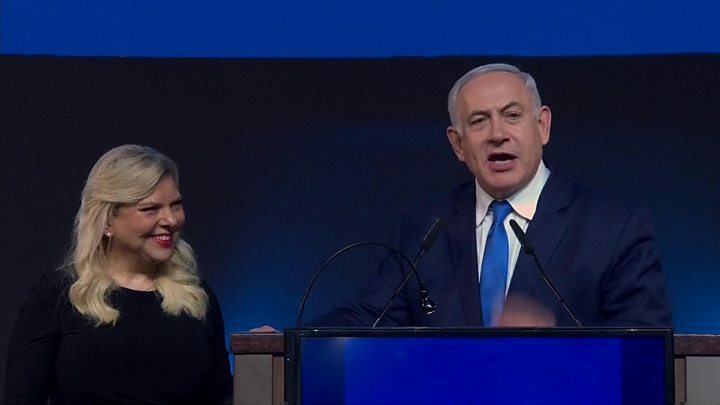 The incumbent PM's Likud party appears most likely to be able to form another coalition government with the help of right-wing nationalist and religious parties. He said history had given the people of Israel another chance as his supporters, using his nickname, chanted: "Bibi, the King of Israel." Why did Mr Netanyahu prevail? In the end, the prime minister was able to rally his right-wing base to deliver the votes he needed. During the campaign, he pitched himself as the sole guarantor of Israel's security. He warned that Mr Gantz would set up a "leftist" government with the support of Israeli Arab parties that would allow the creation of a Palestinian state, which he said would pose a mortal threat to Israel. Mr Netanyahu also promoted his foreign policy credentials, travelling abroad to meet US President Donald Trump and Russian President Vladimir Putin, and hosting Brazilian President Jair Bolsonaro. In a final election-day push, he warned Likud's supporters that if they stayed at home and did not vote their opponents would win. Likud was meanwhile criticised for sending 1,200 observers equipped with hidden body cameras to polling stations in Arab communities. Recent weeks have seen tensions flare between Israel and Palestinian militants in the Gaza Strip, and US President Donald Trump is expected to publish his plan which aims to solve Israel's long-standing conflict with the Palestinians soon. However, ways to revive the moribund peace process were not a main subject of electoral debate. Many Israelis appear to see little hope in the longstanding international formula for peace - the "two-state solution". The phrase denotes a final settlement that would see Israel living peacefully alongside an independent state of Palestine, defined within pre-1967 ceasefire lines in the occupied West Bank, East Jerusalem and Gaza. In the final days of the election campaign, Mr Netanyahu made a significant announcement suggesting a new government led by him would annex Jewish settlements in the West Bank. The settlements are considered illegal under international law, although Israel disputes this. Israel's once-dominant Labour party, which sealed a breakthrough peace deal with the Palestinians in the 1990s, had its worst-ever performance in this year's elections - winning just six seats. What allegations is Mr Netanyahu facing? Now the election is over, evidence in those cases will be turned over to the lawyers of those involved. The prime minister is accused of accepting gifts from wealthy businessmen, and of dispensing favours to garner positive press coverage. Mr Netanyahu has denied any wrongdoing and said he is a victim of a political "witch-hunt". There have been reports that Mr Netanyahu will attempt to persuade potential coalition partners to pass legislation that would grant prime ministers immunity from prosecution while in office. President Reuven Rivlin will consult with political parties. Afterwards, a candidate will be chosen who is deemed able to form a government that controls at least 61 seats in the Knesset. The process could take several weeks. Mr Netanyahu has promised to speedily put together a coalition with his "natural partners". Some Israeli analysts have predicted that this could produce a government that will accelerate the nationalist and conservative policies pursued by the outgoing administration. The ultra-Orthodox parties Shas and United Torah Judaism, which each won eight seats, have said they would join a coalition led by Mr Netanyahu. The Union of Right-Wing Parties, which won five seats, and the centre-right Kulanu party, which came away with four seats, have also said they would back him. Avigdor Lieberman, the leader of the right-wing Yisrael Beiteinu party, has yet to announce his decision. The former defence minister has said he will either sit in opposition or support Mr Netanyahu, but not back Mr Gantz.